G-i-P stands for Gwaith-i-Phethain, ‚The Fellowship of the Word-smiths’ or the linguistic website devoted to post-Tolkienian constructions in the ‚reconstructed’ languages of Middle-earth [link]. A co ze słowami, które wypowiada Radagast oraz Gandalf w scenie, kiedy to Gandalf jest uwięziony w Klatce? Miałem wrażenie, że Radagast tam w którymś momencie mówi coś jakby o Valarach… zamieścicie na ten temat informacje? Będę niezmiernie wdzięczny. Niedługo opublikujemy teksty w kolejnych językach. We are going to publish the movie dialogs in the other languages of the movie Middle-earth soon. Could ‚maewado’ be a misspelled *maevado, from mae+bado<-BAD? Sort of "well-gone" as opposed to "well-met", maybe *mae vannen is imagined by Salo to be a parting formula? What does Kili say to Tauriel on the shores of Esgaroth? Tim: He probably says „my love” in Khuzdul (see: https://dwarrowscholar.wordpress.com/2014/12/11/tbotfa-spoiler-love-is-all-you-need/). On mówi nie „Hîr nín”, a „Ernil” – książę. 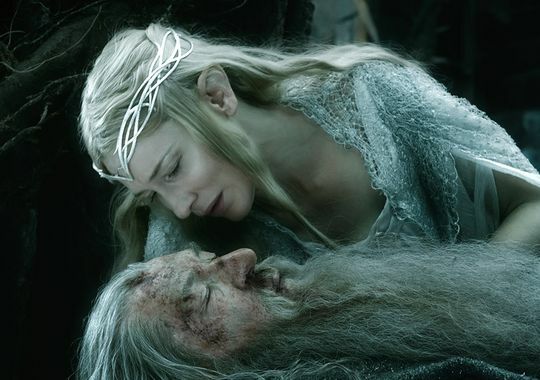 What does gandalf says to radagast in dol guldur? please tell me, i need it to my translation . Thank you for yours Useful site . When will we have the „khuzdul” and orkish dialogs? Just some information for your question, the subtitle provided in Chinese movie theater says „Valar, please come (and protect me)”. I’m poor in Quenya, but since the translator will get a script direct from WB, I think the meaning might be correct, and the word „Valar” sounds pretty obvious to me. Still struggling with what Thranduil and Dain said when they changed their formation & the war was about to start. Dain’s word sounds like Ganag Durinul (march, durin’s folk? Ur… Just my best guess). Thranduil’s word sounds like Dili ni hoen, but I have no idea what it means. Need it for subtitle translation so… any help?